IF you HAVE to see EXODUS: GODS AND KINGS see it in 3D or don’t bother seeing it. The only reason for seeing this film is for the special effects. I sat there wishing Anne Baxter or Yul Brynner would come on screen and start chewing the scenery! I never thought I would think of Charleton Heston as a great actor but I did watching this. If you don’t know what I am talking about please see THE TEN COMMANDMENTS, a 1956 American religious epic film produced and directed by Cecil B. DeMille, that was cheesy and camp! Aside from taking many liberties with the Bible this film is seriously miscast with the two male leads. Christian Bale seems to have only two expressions, neither appropriate to the role of Moses as a leader. We know that ’a child should lead them’ but God as a child? Oh to hear Cecil B. DeMille’s booming voice! Joel Edgerton, as Ramses, has Brynner’s build but wears a lot more mascara. Sigourney Weaver is completely wasted as Ramses’s mother but then most of the women in the film are a second thought. Ben Kingsley and John Turtuuro are given little to work with but do what they can with the underwritten roles. It took 4 writers: Adam Cooper, Bill Collage, Jeffrey Caine and Steven Zaillian to write a script that lets all the actors down and Ridley Scott, the director, and one of the producers, certainly loves the blood and gore. Getting back to the special effects while DeMille had a lot less money and nowhere near the techniques available today most of his effects were cheesy and funny but Scott does everything he can, using every technical aspect available to show the plagues and, yes, his parting of the sea is spectacular. Just for the record, and this may be a mark against me, as I watched Moses etch the tablets--yes he does--while tea is supplied by God, I couldn’t get Mel Brooks, as Moses, in his film HISTORY OF THE WORLD PART 1 dropping the third tablet. 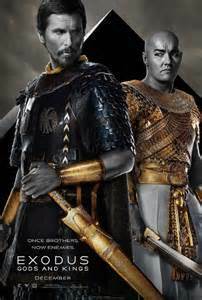 If you haven’t seen this film and/or the Cecil B. DeMille’s film do yourself a favor and watch them instead of seeing EXODUS: GODS AND KINGS!